The City of Boston says that it knows about issues with parking tickets, but that it's up to the driver to fight it. Some drivers in Boston are getting slapped with parking tickets even when, by the city’s own admission, they did nothing wrong. Boston city leaders said the problem is unfair and vowed to fix it. 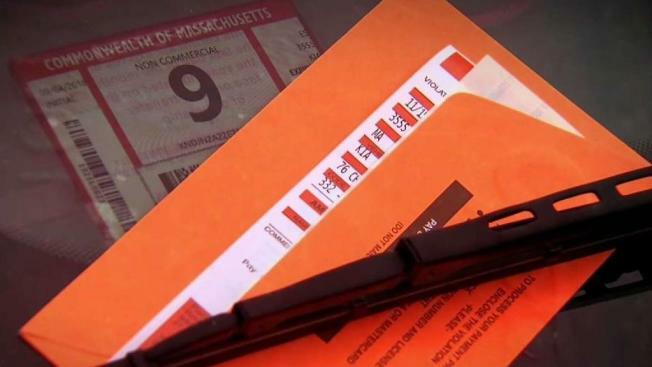 That promise was in response to an NBC10 Boston Investigators report on an attorney and other drivers who repeatedly received over meter limit tickets even after moving their cars every two hours to other parking zones, which city parking rules allow. But until parking enforcement procedures are changed, city officials said it’s up to the drivers to fight the bogus tickets. Lisa Miller works on Beacon Hill and parks on Charles Street so she can have easy access to her car. A few months ago, she showed NBC10 Boston how she uses the ParkBoston smartphone app to comply with the city of Boston’s parking rules that prohibit her from staying on one block or zone for more than two hours at a time. “I set a timer on my phone or I anxiously watch my watch,” she said. After two hours, she moves her car to another block and zone. Two more hours, she moves it again. But she still received four tickets in a row at $40 each for being “over meter limit,” as if she had never left the area. Her receipts show she never parked on the same block or zone for more than two hours in a row, complying with city parking rules. “I don’t think it’s fair,” she said. Once the NBC10 Boston Investigators started asking the Boston Transportation Department (BTD) questions, the city forgave her tickets. But we still wanted to know exactly what she had done wrong. We repeatedly asked to sit down with someone from BTD, but a spokeswoman declined our request for an interview. The city said it’s tough for parking enforcement officers to tell if a driver has left and come back. He said the city shouldn’t force drivers to trek to a City Hall hearing to plead their case when their receipts show they had done nothing wrong. “That’s a day’s lost wages and a huge pain in the neck,” he said. Last fiscal year, the city wrote 107,300 over meter limit tickets. It’s impossible to tell how many were written in error. The city raised the fine from $25 to $40 last summer and with a 92 percent collection rate, they raked in more than $3 million in fines. “We are taking the easy way out as opposed to the right and correct and legal way out,” O’Malley said. Boston launched its parking app four years ago. The city told us the ParkBoston app doesn’t show the parking enforcement officer the parker’s whole history—just their last session. And it’s not set up to block a driver from improperly booking time on the same block or zone after they’ve hit their two-hour limit. Boston Mayor Marty Walsh said he thinks that is a problem. NBC10 Boston checked with other cities, from Cambridge to Cincinnati, that use the same technology. They said when Passport, Inc., created their apps, they insisted on lockout features that would block drivers from paying in zones they’ve already maxed out. Passport declined to answer our questions, but Walsh promised to get to the bottom of it. In the meantime, if you do have to challenge a ticket through a hearing, the city tells us 61 percent of cases are forgiven.